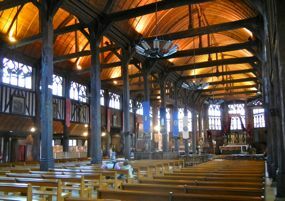 The Église Ste-Catherine church in Honfleur is made entirely of wood, very rare in France. 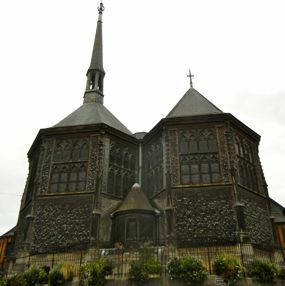 The Église Ste-Catherine, or Church of Saint Catherine, was built following the Hundred Years War to replace a stone church that had been destroyed. It dates from the second half of the 15th century. The story has it that the citizens of Honfleur wanted to thank God for the fact that the British had left their country after a long war. Stone and masons were in high demand and short supply, but the locals were not to be deterred. Using what they knew—building wooden ships—they quickly built a wooden church. The bell tower is separate from the church, perhaps as a fire precaution. The bell tower is today part of the Musée Eugène Boudin. In the 19th century the interior underwent extensive renovations. Today there are two naves, slightly different in appearance.